Cool in the morning, warm at midday and fresh and windy in the evening? When you are active outdoors you need a flexible solution to changes in temperature. 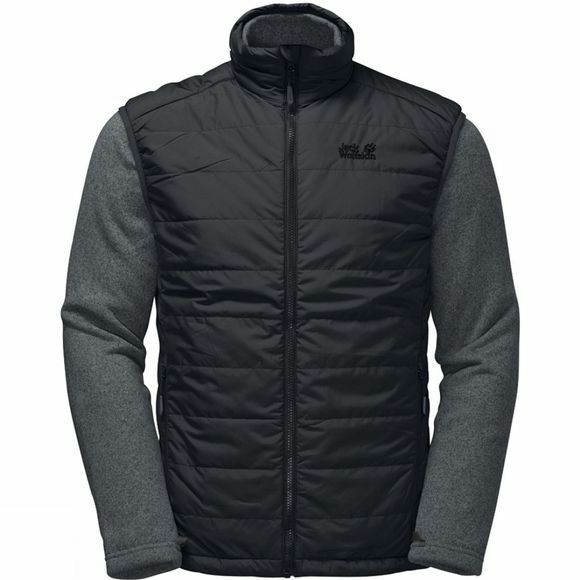 The Mens Caribou Glen 3in1 Jacket from Jack Wolfskin is a versatile zip on combination consisting of an extra warm, knitted-look fleece and a windproof, quilted gilet. Both the gilet and the jacket can be worn separately or combined to create the perfect all-weather solution. The lightweight gilet has a windproof outer fabric and synthetic fibre insulation to keep your core warm. The thick fleece on the arms has a pleasantly soft and comfortable reverse side. It is also very breathable, so moisture vapour is expelled efficiently. Together, they form an effective combination for energetic outdoor activities.